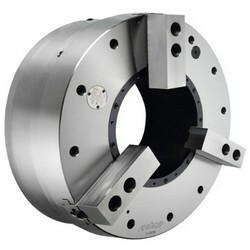 1.Large through-hole 3-jaw power chuck with build in air cylinder. 2.With build-in “pressure detection” device in chuck which can check the pressure is lowered rapidly within the chuck, guarantee to the security of operating. 3.Patented air supply system, it is easy to install and maintain. No abrasion issue of traditional sealed ring. Maintenance cost and time can be saved. The dimensions and the specifications ofAP-Aare in thered data.